What’s the most effective way to address anxiety disorder? CBT, according to multiple studies. Extensive studies conducted over the last 10 years have found that CBT is the most effective treatment for anxiety disorders. As such, it is considered the ‘Gold Standard’ in the treatment of anxiety disorder. The studies were extensive and conclusive…and all agree. This study also includes this statement in its conclusions, “Despite some weaknesses of the original studies, the quantitative literature review of randomized placebo-controlled trials and of trials in naturalistic treatment settings provides strong support for both the efficacy and effectiveness of CBT as an acute intervention for adult anxiety disorders. “…the meta-analyses confirm that CBT is by far the most consistently empirically supported psychotherapeutic option in the treatment of anxiety disorders. Thus, CBT can be recommended as a gold standard in the psychotherapeutic treatment of patients with anxiety disorders,” the study concludes. After many years of study and carefully evaluating the evidence, the conclusion is clear: CBT is the Gold Standard for anxiety disorder resolution. And this makes sense. Since anxiety disorder is caused by behavior (the ways we think and act), identifying and successfully addressing those unhealthy behaviors solves the anxiety disorder problem. When a person learns to cope with adversity, uncertainty, risk in healthy ways rather than anxious ways, problematic anxiety disappears. This finding agrees with our personal and professional experiences with anxiety disorder. All of us at anxietycentre.com experienced and personally overcame a struggle with anxiety disorder. The work we did involved dealing with our overly apprehensive behaviors: identifying and successfully addressing the unhealthy ways we coped with adversity, uncertainty, and risk that caused issues with anxiety. When we changed the way we behaved, we achieved a healthy outcome. If you are struggling with anxiety disorder, you can overcome it. The road to recovery is clear, well traveled, and well studied. Based on the research, and our personal and professional experiences with anxiety disorder, the most effective way to overcome anxiety disorder is with the help of an experienced anxiety disorder therapist, and one who has personally experienced and overcome anxiety disorder in his or her own life. There’s a vast difference between talking the talk and walking the walk. We’ve been there and we’ve overcome anxiety disorder ourselves. Not only do we know the nuances and subtleties of recovery, we lived them. Because we know the hardship anxiety disorder can cause, we’re passionate about helping others achieve the same level of success. So don’t suffer needlessly. If you’ve had enough with anxiety disorder, we’re here to help you in your quest to overcome anxiety disorder. Otte, Christian. 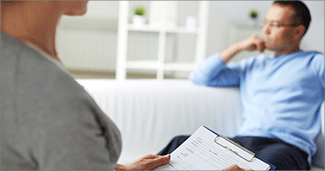 "Cognitive Behavioral Therapy in Anxiety Disorders: Current State of the Evidence." Dialogues in Clinical Neuroscience. Les Laboratoires Servier, Dec. 2011. Web. 19 Sept. 2016. Hofmann, Stefan G., and Jasper Smits A. J. "COGNITIVE-BEHAVIORAL THERAPY FOR ADULT ANXIETY DISORDERS: A meta-ANALYSIS OF RANDOMIZED PLACEBO-CONTROLLED TRIALS." The Journal of Clinical Psychiatry. U.S. National Library of Medicine, Apr. 2008. Web. 19 Sept. 2016. "Treating Anxiety with CBT: The Evidence." AIPC Article Library. N.p., n.d. Web. 19 Sept. 2016.
anxietycentre.com: Information, support, and coaching/counseling/therapy for problematic anxiety and its sensations and symptoms, including the latest in anxiety research such as that CBT is the Gold Standard treatment for anxiety disorder.